People often preach the virtue of “less is more” but I think there is merit to the “more is more” approach. Homemade bread is a good example. How satisfying is it to bite into a slice generously studded with briny olives or to sink my knife into a loaf loaded with plump currants? I had the pleasure to experience both last weekend with just a bit of minimal effort. Bread baking does not need to be complicate. As long as you’re willing to invest in a bit of time and patience, you too can share this wonderful experience. Baking bread at home means that I do not need to count my pennies when it comes to loading my bread with tasty add-ins. A whole jar of kalamata olives? Sure! Half a pound of currants? Why not? On top of that, I got to use fresh dried herbs and good quality spices. 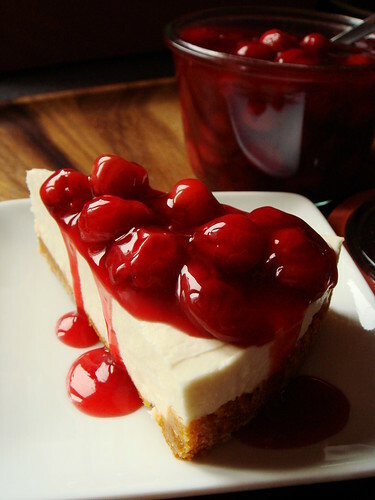 Such small indulgences are quite affordable in the home kitchen. 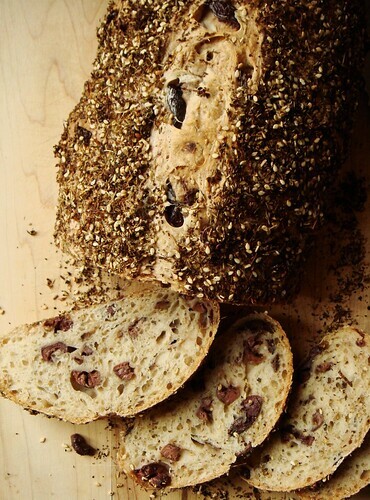 It was small price to pay to indulge in Currants Cinnamon Bread or Black Olives Sesame Bread coated in oregano, thyme, sumac, and lemon zest. So You Think You’re Hungry? Ever since I brought to life my concept of reimagined in-flight meal, I have been meaning to follow up with my version of TV dinner. 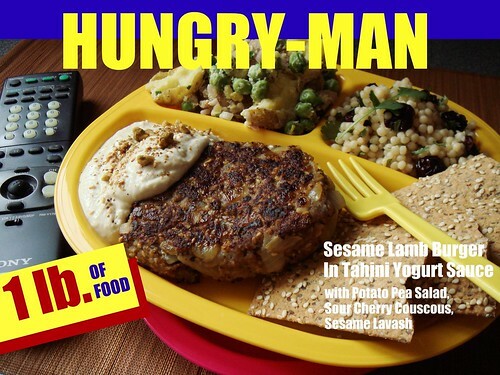 The idea has been sitting at the back of my mind for almost a year but I’m pleased to at last unveil Dessert By Candy’s Hungry-Man TV Dinner! Rather than your run-of-the-mill Salisbury steak or fried chicken or roast turkey, my hearty TV dinner (1lb. of food!! Of course it’s hearty) takes plenty of culinary influence from North Africa. A juicy piece of sesame lamb burger is served with garlicky tahini yogurt sauce and sprinkled with dukkah. It is paired with crushed new potato & pea salad in mustard seed dressing, sour cherries Israeli couscous, and flaxseed sesame lavash. Are you hungry yet? Celebrating lunar new year the Chinese way is a multi-day ordeal. Last night I tried explaining to American Boyfriend how we used to visit family and friends with a scheduling algorithm that assigns priority based on seniority in the family, how close we are, geographical location, and whether we can optimize one visit to meet with as many people as possible. The goal is to meet everyone on the (very long) list within the three statutory holidays though there is some leeway since the new year celebration officially lasts for ten consecutive days. Boyfriend’s head just about to explode before I even got around to explain the etiquette of red pockets. With all the visiting back and forth, of course the house needs to be stocked with treats for the guests. On Monday I wrote about Split Pea Coconut Pudding 椰汁馬荳糕 and last year I shared with you my recipe for Steamed Turnip Cake 臘味蘿蔔糕. Both are very traditional recipes. 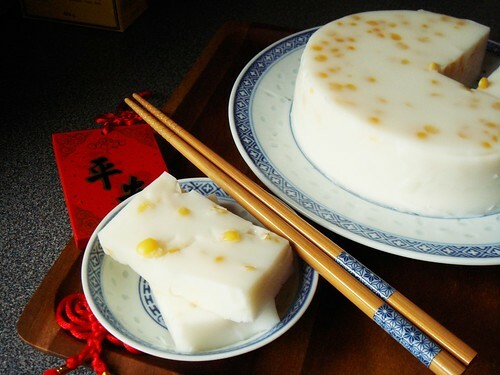 Another popular choice is steamed glutinous rice cake, nian gao 年糕. I absolutely love the soft chewy texture reminiscent of Japanese mochi. Unfortunately, the cake hardens up once cooled. My favourite way to enjoy nian gao is pan fry the slices with a thin coating of eggs. It’s totally awesome but can be a greasy treat, not to mention a lot of work. Enter the baked glutinous rice cake. This is a fusion dessert that combines the traditional taste and texture of steamed rice cake with the richness and ease of butter cake. You can simply slice and serve the cake at room temperature yet still enjoy the soft chewy texture of rice cake. I can’t get enough of this! I’m very impressionable when it comes to traditional holidays and festivities. Even though my family has never been too enthusiastic about lunar new year celebrations, traditions and cultures taught me a few mandatory things for this auspicious time of year. Even though I was rather busy last weekend, I did manage to squeeze in enough time to make a couple of new year cakes. “Cake” is a loose translation of all the savoury and sweet round puddings we eat for new year celebration. 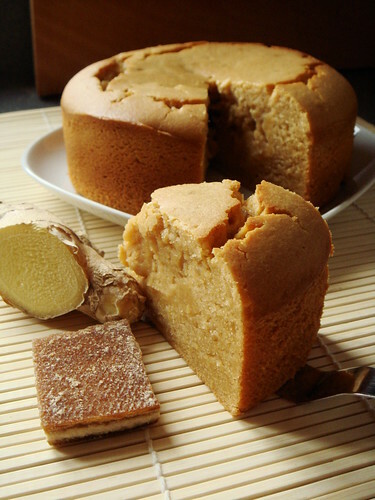 In Cantonese, such puddings are called Go which share the same pronunciation as tall or height. They are enjoyed as much for taste as the implied well wishes of promotion in career or children growing taller. Cake is a rather generic term to describe all these round puck puddings. They can be made with rice flour, starch, grated vegetable, agar agar, tapioca, or beans for a range of various texture. Soft, sticky, starchy, delicate, creamy…you can take your pick. I always make a batch of steamed daikon cake 臘味蘿蔔糕 since it is a family favourite. As for the sweet selection, there are quite a few that I like. This year, I went for something less labour intensive. Enter my personal favourite Coconut Pudding with Yellow Split Peas 椰汁馬荳糕. My recent interest in bread baking has naturally led me to the joy of using whole grain flours. The flavour and behaviour for spelt, kamut, rye, whole wheat, buckwheat, red fife wheat are all different than the common unbleached refined wheat flour. Dare I say they have more character? It did not take long before I amass a small collection of flours in all their many shades of white. One challenge of using whole grain flour is lightness and crumb quality. All that outer layers of grain contribute deep flavours but at the same time they are of little help to gluten development. 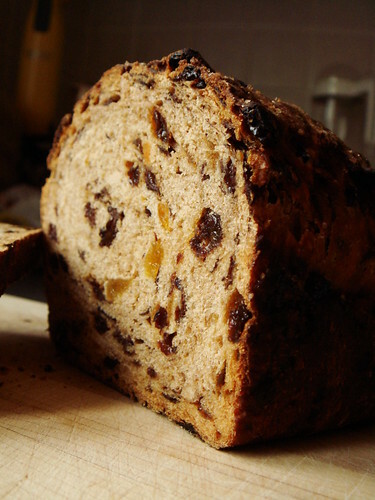 It is not uncommon that the dough feels sticky while the baked loaf turns heavy and crumbly. 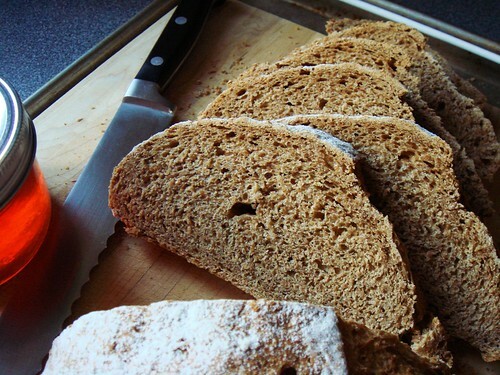 One solution is to make your bread using part white flour and part whole grain flour. For those who are keen on making 100% whole grain bread, there is a secret weapon in vitamin C.
What promised to be a dish of easy sophistication can sometimes backfire into a string of complications. Around My French Table has a recipe for M. Jacques Armagnac Chicken involving roasting a whole chicken and vegetable with the pricey spirit inside a dutch oven. 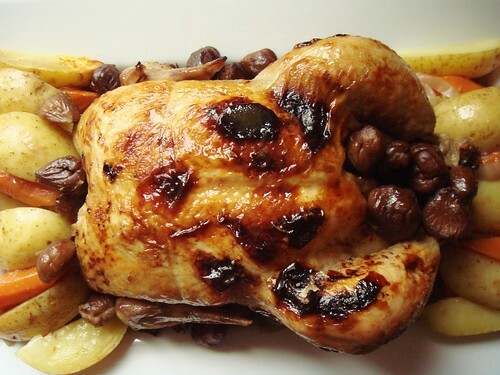 The goal is that the chicken stays juicy yet everything is infused with the taste of Armagnac. Seems easy enough, no? Not so fast. It’s a golden rule in cooking that when you trade off complexity, your ingredients better be of exceptional quality to stand up to the spotlight. As a regular shopper at farmers market, I am confident in the quality of my potatoes, carrots, onions, and chestnuts. My first obstacle was getting a good chicken. Quite simply put, I vote with my money. Over the last few years, I’ve been feeling more uneasy about my food living a life of captivity before landing on my plate. Long story short, I needed to get a free-run chicken for the recipe. Luckily, a quick jaunt to Whole Foods got me a $16 roaster already cleaned and trussed. Next was Armagnac. For ten years, I’ve carefully avoided any recipes calling for this pricy spirit. I come from a family of non-drinkers and shelling out $50 for a full size bottle is definitely out of the budget. I was ready to roast my chicken with either Grand Marnier or Poire Williams, both of which I use on a regular basis. My nagging suspicion is that the flavour would be jarring so I dropped by the liquor store in hopes to find reasonably priced substitute. What do you know? They do carry 200mL bottle of Cognac! 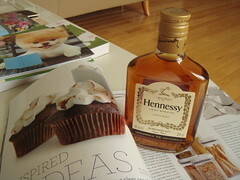 Obviously it is not the kind I would serve as post-dinner tipple but for all intents and purposes, it would do. That would be $18 please. 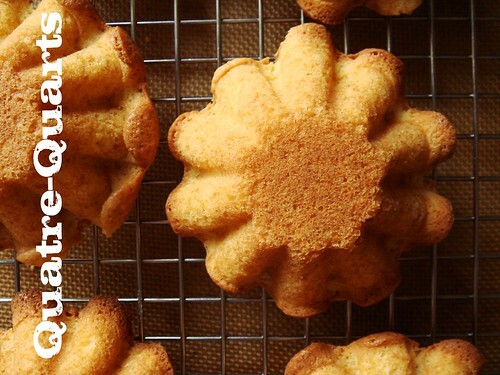 My to-bake wish list swells and shrinks depending on the seasons. The frenzy leading up to Christmas always leaves me with regret of not baking all the tempting recipes I bookmark. After the holidays, a virtuous healthy eating attitude typically takes hold and baking has no space in my definition of wholesome eating. When the weather warms up, so does the myriad colour in the market. All that fruit and vegetable signal the beginning of canning season and the heat of oven seems a bit harsh for their natural beauty. Harvest in autumn is really the only time I get to indulge in my to-bake wish list. In season ingredients are plentiful but the cooler temperature also suits such warmer flavour as chocolate, caramel, and spices. 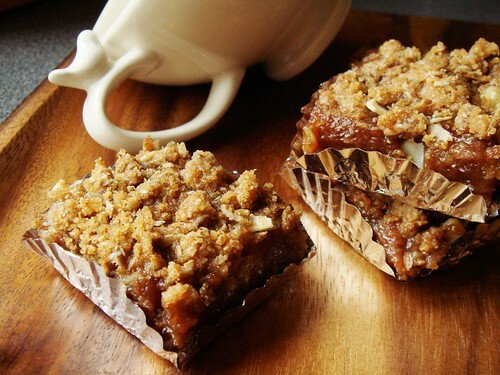 One item that never leaves my to-bake wish list despite the change of season is date square. This homely bar cookie did not catch my attention for years with its lack of visual appeal and the starring role of dates. 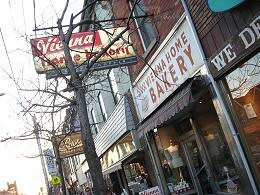 That all changed in 2006 when I visited the now-defunct Vienna Home Bakery in the West Queen West neighbourhood of Toronto. Around that time, the neighbourhood became more hipster by the day and stalwart businesses such as Vienna were closing shop by choice or not. I was lucky to visit the bakery with its long counter, stools, humble display cases, and intimate atmosphere created by long-time employees. I ordered a piece of their famous date square upon recommendation of the owner and was immediately won over. The date square was like a portable fruit crumble except the saucy apple pieces were replaced by an layer of more intense date puree scented with orange. The texture of a pleasantly chewy bottom crust contrasted well with the crunchy crumbly topping and silky fruit filling. I was hooked. I embrace food in all its animal and vegetarian glory but I develop intense cravings for vegan dishes over stretches of time occasionally. Such cravings are usually spurred by fatigue of cooking meat dishes for the boys. Sure it is fun to cook and eat finger-licking-good ribs, juicy roasts, and pan-seared steaks with that irresistible char. But honestly, my true love lies in a rainbow of colours and shapes from vegetable, legumes, and whole grains. Since my return from Virginia, vegan is the name of the game and I cannot be happier. Novice vegan cooks often find it difficult or creatively restrictive to cook without animal products. I know I was. However, experience and knowledge taught me that it is merely a difference between the glass half-empty and half-full attitude. There is a lot of flavour to be coaxed out of vegetables. Conversely, whole grains and beans are perfect receptacle for flavour. Together they make a really good team for some truly satisfying dishes. 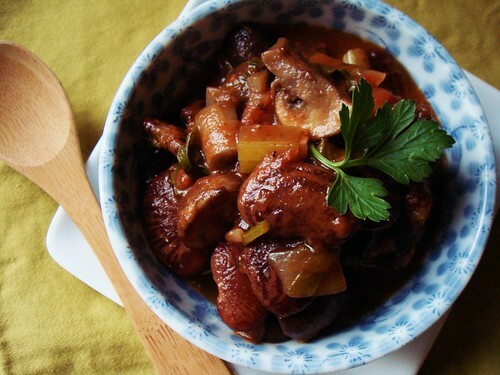 Last weekend’s Heirloom Beans and Mushroom Stew was an illustration of this example.